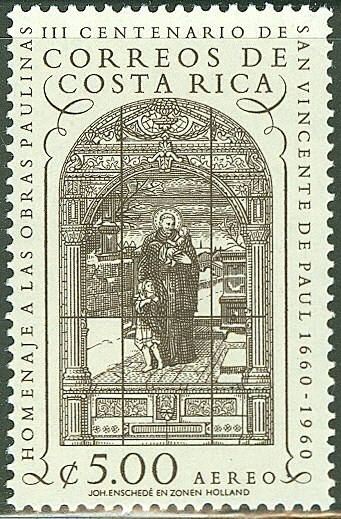 In 1960, Costa Rica issued a set of five airmail stamps honoring Saint Vincent and St. Louisa (Scott #C298-302). 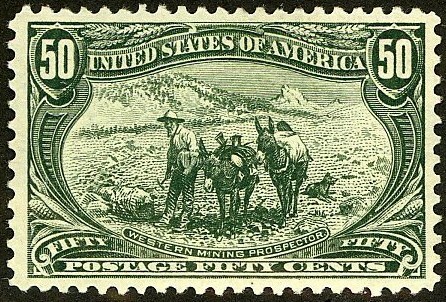 20,000 were issued, and Scott '13 prices the unused set at $3.25. Aside from being yet another grossly undervalued Latin American issue, the set doubles as a Religion Topical. A small nation of 4 1/2 million people, Costa Rica is unique as the only Latin American country to have escaped the plague of repressive dictatorships and oligarchies endemic to the region. Costa Rica has generally enjoyed greater peace and more consistent political stability than many of its fellow Latin American nations. The government offers generous tax exemptions to those investing in the country,and in recent times electronics, pharmaceuticals, financial outsourcing, software development, and ecotourism have become the prime industries in Costa Rica's economy. High levels of education among its residents make the country an attractive investing location. Annual GDP growth has averaged 5.6% over the last 5 years. I have begun a new blog, "The Stamp Specialist", which will feature my buy prices for stamps which I am interested in purchasing. I've posted a buy list for Costa Rica, which includes several sets recommended in this blog. Viewing dealers' buy lists every now and then is an excellent way to keep current on the vagaries of the stamp market.